DC44 Vs DC45 -- What's the Difference? If you are trying to figure out the commonalities as well as the differences between the Dyson Digital Slim DC44 and the DC45, then this is the right article for you. With the short and accurate answer being: there actually aren't any differences between them (except that of the name). It is actually the exact same cordless vacuum cleaner, hence it is equipped with the same attachments/ accessories, has the same cleaning suction power, same battery life, it comes in the same purple/ silver mesh colour etc. The simple reason behind it being given the two names (both DC44 and DC45) are just to do with retail and trademark rights -- whereby the Dyson Digital Slim Mark II goes by the name of the Dyson DC44 when sold within the U.K and U.S. and then by the DC45 when sold within countries/areas such as Canada and Continental Europe. So there is actually no real difference of the 'DC44 Vs DC45' comparison -- because as stated they are effectively the exact same vacuum. Cleaning Performance -- When it comes to the 'cleaning suction power' of the Mark II it is provided with two modes -- a 'standard' option that allows for 28 Air Watts (with the battery life - lasting for 20 minutes) as well as a 'boost' option that offers you an extra 37 Air Watts (i.e total 65 Air Watts) however the battery life is significantly reduced (lasting just 8 minutes). Hence, obviously not as powerful as your standard vacuum cleaner, but it still does a surprisnlgy sufficient job. Moreover, as with all standard Dyson vacuum cleaners, the DC44/ DC45 is fitted with Dyson's unique Root Cyclone Technology meaning that firstly it has the benefit of being bagless (saving you on running costs of replacing the vacuum bags etc.) and secondly it doesn't suffer with loss of suction (i.e with the build up of dirt and debris being sucked up, the suction power doesn't diminish like you find with many other non-Dyson vacuums). Ease of Use -- weighing in at only 2.2 kg (approximately 5.07 lbs), with the weight primarily distributed within the handle, makes the Mark II incredibly light and easy to operate (a perfect cleaning machine for those who are either elderly or have mobility issues). Allowing you to clean an array of areas (high and low, demonstrated in the video summary below) from hard flooring to soft flooring (like you would with a standard upright vacuum). 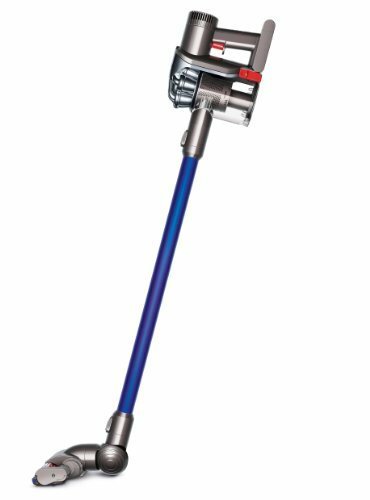 Moreover, you are able to detach the wand, so that the DC44 (DC45) can act essentially like a handheld vacuum (very much like the Dyson DC34), allowing you to vacuum awkward gaps easily (especially in a car/stairs etc.). The DC44 (DC45) also comes with a wall mounted docking station (which charges the Dyson Digital Slim when not in use), which certainly comes in useful for those who are limited on storage space and is just generally good for keeping a clean and organized household (dimensions with wand: Height - 1120 mm x Width - 230 mm x Depth: 300 mm) . 'Practical' Features -- as said the battery of the DC44 (DC45) lasts for 20 minutes on 'standard' mode and 8 minutes on 'boost mode' and takes approximately 3.5 hours to recharge (some people buy a separate cordless battery pre-charged to continue the vacuum) -- you also get an LED display indicated when the vacuum is charged and 'about' to run out of power. The bin capacity is rather small being only 0.35 litres, but as you should know the DC44/DC45 isn't there for completely replacing that of a standard sized corded vacuum, rather to supplement it. In terms of attachments that come with the DC44/45, you get a 'combination tool' which is basically a crevice tool for vacuuming awkward and tight gaps and areas which also doubles up with a brush nozzle to allow for powered dusting. You can buy additional attachments to improve the cleaning multi-functionality of your DC44/DC45 further such as the Dyson Cordless Tool Kit (see below). 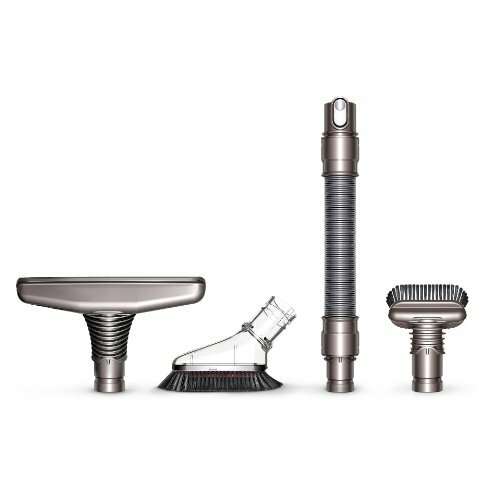 * Stubborn Dirt Brush: a specially designed tough nylon bristle brush that is primarily used for removing tough 'dug-in dirt stains within soft flooring and removes them through generating a 'flicking motion' to pop out the dirt form the carpet. * Soft Dusting Brush: a brush that has delicate nylon bristles attached, meaning it can allow you to vacuum delicate areas and objects without fear of damaging/scratching them. * Extension Hose: simply allowing you to get some extra reach into an awkward and tight gap. * Wide Nozzle Tool: the wider nozzle will allow for greater and faster collection of dust and debris compared to the standard combination tool that you are initially provided with. If you have any questions, remarks or comments regarding either the overview of the 'DC44 Vs DC45' or about the actual cordless vacuum cleaner itself (e.g. mechanical specifications etc.) then please do not hesitate to leave them in the comments section below and I will be sure to get back to you as soon as possible.